Just an hour south of Cairns, a tropical haven awaits. Nestled in the foothills of Queensland’s highest mountain range, Bartle Frere, Josephine Falls is often referred to as “nature’s playground” with a natural rockslide being the main attraction of the beautiful cascades. It’s an easy 600m walk to the bottom swimming hole with wheelchair access available to the viewing platform at the top pool. While it looks tempting, swimming in the top pool is prohibited but there’s plenty of space at the bottom pool to spread out. Located only 25mins from Cairns CBD in the Redlynch Valley, Crystal Cascades is a series of swimming holes and cascading falls. Venture to the end of the track for the most impressive of the falls or simply bring your floaty and retreat to one of the more shady pools along the way. For the more adventurous, Raging Thunder Adventures conducts canyoning tours at Crystal Cascades which will see you abseil, zip line, slide and jump your way along a separate section of the gorge. Tucked away in the dense rainforest close to Crystal Cascades is Fairy Falls, a picturesque waterfall as magical as its name. Some rock hopping is required to reach this natural plunge pool, but the end result is definitely worth it. The track begins in the scrub on the left side of Crystal Cascade’s carpark and when the well-worn path opens to the creek, it’s time to ditch your shoes and follow the creek bed up for a few minutes. Hot tip: The journey from carpark to falls should take no more than 15 mins. Don’t be fooled by the mistaken path created by the footsteps of past travelers that appears to take you on a very steep incline away from the creek. Local favourite Stoney Creek is an easy drive away from Cairns CBD. To get here, simply head down Cairns Western Arterial Road turning off at Stoney Creek Road, Kamerunga and follow to the end. A track cuts through the rainforest, over a small footbridge and continues to run parallel to the creek with many pools offering a cool refuge on the 25min walk to Old Weir Falls, the final destination of your journey. While completely concreted, the 3.2km trek up to Behana Gorge can be tough to combat in Tropical North Queensland’s heat so be sure pack a couple of water bottles before conquering. Your reward? The spectacular Clamshell Falls, the main attraction of Behana Gorge. There’s plenty of space to set up a picnic but not before cooling off in the refreshing and icy waters. For an energy injection before you begin, stop by the bakery in nearby Gordonvale for a fresh homemade pie. As the lush rainforest of Kuranda changes to typical Aussie bush, you may find it hard to believe that nestled amongst the hills, cascading over giant granite boulders is the incredible Davies Creek Falls. Swim in the infinity pool atop of the falls and pitch a tent at the campgrounds nearby so you can appreciate the area a bit longer. Davies Creek Road turnoff is 21km past Kuranda and the gravel road to the falls is accessible to conventional vehicles for most of the year (caravans are unsuitable). Calories don’t count on a hot day when there’s ice-cream involved. Pick your favourite frozen treat at Emerald Creek Ice-Creamery before hitting the dirt road to Emerald Creek. A short ten-minute walk from the carpark will get you to the falls which, like Davies Creek, flows from the rainforests of the Lamb Range through to dry sclerophyll forest surrounds. In recent times Emerald Creek Falls has become one of the region’s most Instagrammable locations with its clear waters tumbling over smooth granite, into placid ponds. In a scene more fitting to a painting, Mena Creek Falls sits adjacent to the moss clad Spanish castle, Paronella Park. While you can view the falls for free from the suspension bridge above, admission fee to the park will connect you with the greatest love story in Tropical North Queensland. Not only will you get a better view of the falls, you’ll find a magical wonderland slowly being reclaimed by the rainforest. The guided tour will explain the history of the castle and how the Spaniard harnessed the power of the falls to create North Queensland’s first hydro-electric plant. While there’s no is no swimming at Mena Creek Falls, the beauty of the park is enough to keep you occupied. In the secluded Mowbray Valley, just outside Port Douglas, you’ll find Spring Creek Falls. With no set path, your best way to get there is a guided bush walk from Back Country Bliss. The tour includes complimentary pick-up from Mossman or Port Douglas followed by a challenging 3km rock-hop stopping by multiple waterfalls and deep pools. Tucked away in Herberton Range Conservation Park, just south-west of Atherton, Halls Falls boasts a stunning pool in between two waterfalls – all under a 15 minute walk from the car park. Kick back and relax in the clear water as you take in the uninterrupted beauty of the surrounding forest. If you’ve found this little gem, then it’s highly likely you’re into local secrets. Make tracks for the nearby township of Herberton and spend the rest of your day discovering the treasure trove that is the Historic Village Herberton, the only Queensland museum to be named in Australia’s Top 10 Museums by Trip Advisor. While its name may provoke images of the nearby Hartley’s Crocodile Adventures, rest assured Hartley Creek Falls is free from the ancient reptile and a safe place to swim. The track leading up to the falls is roughly 7.5kms return and travels through World Heritage Listed Wet Tropics Rainforest, so make sure you pack those runners and plenty of water. Note: Crocodiles may be present in the brackish water further down the creek, nearest to the Captain Cook Highway and swimming here is not permitted. Close to the world-renowned Millaa Millaa Falls is the lesser known Pepina Falls. From Millaa Millaa follow the Old Palmerston Highway stopping at Middlebrook Creek bridge and take the short walk down to the falls from here. These smaller falls are great for those wanting to escape the crowds and cool off somewhere more private. They are best viewed after the wet season when the rain has replenished the water supply. Tucked away in the Misty Mountains area not far from Pepina Falls is Souita Falls, a pair of two beautiful waterfalls. Surrounded by lush vegetation, the first falls are a 150m walk and the second a further 70m down. From Millaa Millaa head down the Old Palmerston Highway for 7kms turning off at Middlebrook Road and following a further 4.8kms. The track down is easy to miss so keep an eye out as you pass over the creek crossing. Kearneys Falls is part of a cascading tributary of the Mulgrave River. A viewing platform to the base of the falls is accessed via the Wajil Track through the Goldsborough Valley camping area. The local Traditional Owner group, the Dulabed Malanbarra Yidinji Aboriginal people have an intimate knowledge of the area and insights into their culture are signposted along the 1.7km return walk and within the campgrounds. For a different perspective, head to the end of the campgrounds and walk 250m up the Goldfield Trail for a great view showing off the sheer size of falls. 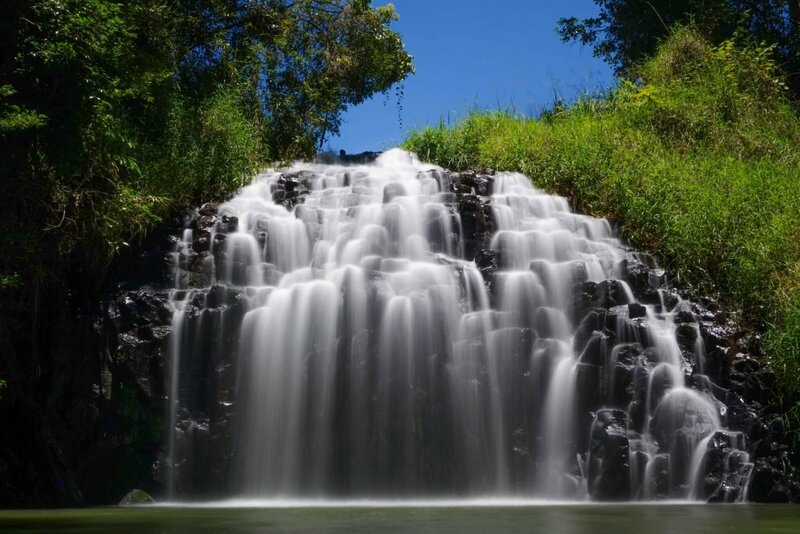 Crystal clear waters, naturally sculptured granite boulders and a heavy rush of water makes up the picturesque Murray Falls approximately halfway between Tully and Cardwell. While swimming at the falls itself is restricted, it’s only a few minutes walk to a great swimming hole downstream, complete with its very own natural waterslide. The Yalgay Ginja Bulumi walk offers views from above which looks out to the Kirrama Range and Murray Valley. The best way to experience the Murray Falls and surrounds is to pitch a tent at the campgrounds, a mere 300m from the waterfall. Introducing Little Millstream Falls, the younger, lesser known member of the Millstream Falls family. Follow the walking track to the base of the falls and take a swim in the large inviting plunge pool. Located just minutes away from Queensland’s highest town, Ravenshoe, take the opportunity to stock up on some picnic supplies and make a day of it at this tranquil spot. Located on private property, this peaceful paradise can only be accessed by booking a tour with Daintree Discovery Tours. Both their full day and half day tours load you into a safari-style 4WD and onto mossy Cassowary Falls where their exclusive access guarantees a placid swimming hole surrounded by lush tropical rainforest. Appropriately named, these falls truly are a vision to behold. Tucked away in the rainforest surrounding Lake Eacham, a short 300m walk will bring you to this secret spot. As the road out of Lake Eacham divides into two (the left to Atherton and Yungaburra), take the right turn, which leads you down Wrights Creek Road – follow the road until you reach a small bridge, which marks the start of the walking trail. If you’re feeling peckish after all that adventuring, head to nearby Yungaburra Pub and keep an eye out for a black and white photo of the falls hanging amongst other historic imagery of the Tablelands. Located along the Tully River, you have two ways to reach the beautiful Ponytail Falls – Drive or raft. If you’re driving, follow the river downstream from Cardstone Weir and look out for the number 11 painted on the road. If you’re taking the more adrenaline-pumping approach, book a full-day white-water rafting tour with Raging Thunder Adventures and admire the falls as you tuck into a BBQ lunch on the embankment overlooking this single drop waterfall between rapids. Lace up your hiking boots and get ready to sit atop an infinity pool with unparalleled views over the Wet Tropics World Heritage Area. Accessed via the Old Cairns Track, Windin Falls is a well-deserved reward following a 90min hike each way. Ticked off these 20 waterfalls? There’s plenty more to see. Refresh and rejuvenate in Tropical North Queensland.